The second edition of a bestseller, Quantitative Methods and Socio-Economic Applications in GIS (previously titled Quantitative Methods and Applications in GIS) details applications of quantitative methods in social science, planning, and public policy with a focus on spatial perspectives. 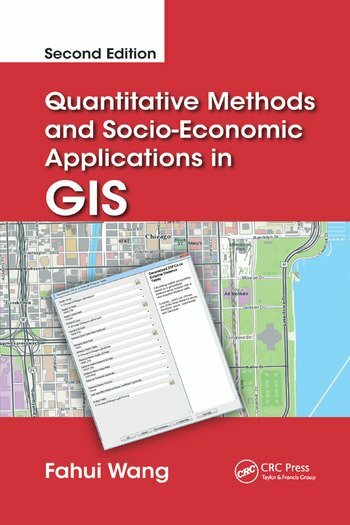 The book integrates GIS and quantitative (computational) methods and demonstrates them in various policy-relevant socio-economic applications with step-by-step instructions and datasets. The book demonstrates the diversity of issues where GIS can be used to enhance the studies related to socio-economic issues and public policy. Each chapter has one subject theme and introduces the method (or a group of related methods) most relevant to the theme. While each method is illustrated in a special case of application, it can also be used to analyze different issues. For example, spatial regression is used to examine the relationship between job access and homicide patterns; systems of linear equations are analyzed to predict urban land use patterns; linear programming is introduced to solve the problem of wasteful commuting and allocate healthcare facilities; and Monte Carlo technique is illustrated in simulating urban traffic. The book illustrates the range of computational methods and covers common tasks and major issues encountered in a spatial environment. It provides a platform for learning technical skills and quantitative methods in the context of addressing real-world problems, giving you instant access to the tools to resolve major socio-economic issues. Fahui Wang is James J. Parsons Professor and Chair of the Department of Geography and Anthropology, Louisiana State University (LSU), and recipient of LSU Distinguished Faculty Award (2018). He earned a BS degree in geography from Peking University, China, an MA degree in economics and a PhD degree in city and regional planning from The Ohio State University. His research interests include GIS applications in human geography (urban, economic, and transportation), city and regional planning, and public policy (crime and health). His work has been supported by the National Science Foundation, U.S. Department of Energy, U.S. Department of Health and Human Services (Agency for Healthcare Research & Quality and the National Institutes of Health), U.S. Department of Housing and Urban Development, U.S. Department of Justice (National Institute of Justice and Office of Juvenile Justice and Delinquency Prevention), and the National Natural Science Foundation of China. He has published over 120 refereed articles. He is the editor of Geographic Information Systems and Crime Analysis (IDEA Group Publishers, 2005) and co-editor (with Xun Shi) of Applications of Geospatial Information Technologies in Public Health (Higher Education Press, 2016, in Chinese) and the author of Quantitative Methods and Applications in GIS (CRC Press, 2006) and Quantitative Methods and Socioeconomic Applications in GIS (2nd ed., CRC Press, 2015). March 18, 2015 click on http://ga.lsu.edu/blog/fahui/?